PRISTINA – Every day, thousands of Swiss people receive telephone calls out of Kosovo. The reason: hundreds of German speaking Kosovars work for the call center Baruti. The office is based in the capital Pristina. The Swiss call center has currently 240 people deployed. The employees are active in marketing research, and customer care. They do everything in the German language, for the German speaking market. Shala is just 26 years old, but already leading a pretty big company. “Till a while ago, I knew every one by name. 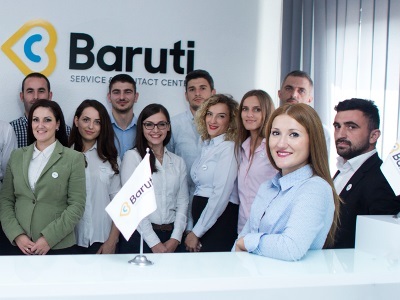 But that has become very difficult, since we hired dozens of new people in the last months.” And that will become more difficult, since Baruti expects to grow to 550 jobholders, in 2016. Some of them work full time, some of them part time. The office has their own cafe, where people can rest and have a drink. 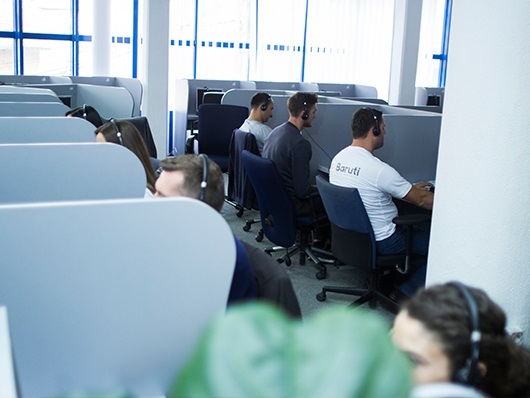 In the beginning, companies were very surprised by the fact that a Kosovar call center would handle their customer care or marketing research. “Some people even asked me if cars and internet exist in Kosovo.” Now, three years later, no one will doubt about the quality. “We have a great reputation, both in Switzerland, as in Kosovo. And that is not strange, because Kosovo has a European focused culture, and many talented, and intelligent young people. Did you know that you can fly directly from several German and Swiss cities to Pristina?